I read Ruchita Misra’s first novel which is the first part of this series as well a few months back. I thought it was a decent one time read and to be honest I wouldn’t have picked up the second book if I had based my opinion her first book but the thing is I bought both the parts together and the second book- I do, do I was lying on my bedside for a while till like last week when I had no other book to read. For those of you who haven’t read the first part, well let me first introduce the characters. Kasturi Shukla finally found her eligible bachelor in The (In)Eligible Bachelor and is all set to marry him. As every other bride to be, she has a lot of doubts about her life after the wedding and in a moment of indecision, steps across a line that she should never have been near. To make things worse, her two best friends are now nauseatingly mushy star-crossed lovers with a very filmy twist in their love story, her future mother-in-law thinks the kitchen-phobic Kasturi is a fabulous cook, her colleague Padma hates her for no reason, her boss wants medical intervention for her imaginary deafness and her mother has become a cyber-celebrity. So basically she is going crazy and has no clue what to do with all these problems. Now as I mentioned before, I wasn’t really impressed by the first book but I have to say I found the narration in this part to be much better than the debut novel. the story has a better pace, the humour is better and the overall story leaves a smile on your face. There are alot of melodramatic parts in the but overall the book has a very relatable plot, funny and slightly emotional. The language, like the first book is pretty simple and straight forward. Another thing that I really liked about the book was the fact that one Mr. 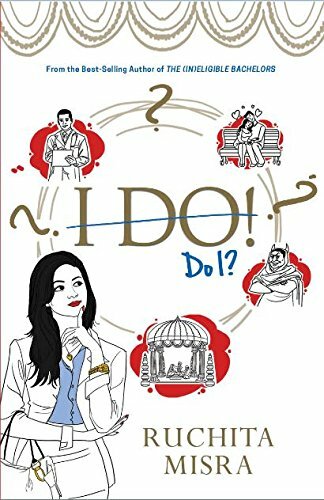 Eligible, a.k.a Dr. Purva did not really get alot of attention in the last book but I loved how the author developed his character in I Do! Do I?. The character development for other characters was a lot a tab better than the forst novel and alot of characters appeared very relatable. All in all, I would say that I enjoyed reading this book more than the previous one even though this might be a biased opinion considering that I am getting married in a few months and going through the same dilemmas but overall this book just made more sense. Also, a fact I can clearly see and appreciate is that the author took in the initial feedback and has kept it mind while penning down this one. I would definitely say this book is a good read particularly if you are getting married……because you will love it.